Matthew: I am not necessarily averse to tropes in sci-fi storytelling. But if there is one trope that has worn out its welcome after 7 seasons of TNG and 3 of DS9, it's the holodeck malfunction. I'm sorry, but it just beggars belief each time this magical everything box decides to swallow a person whole, the "safeties" malfunction, and you just have to wonder how and why these death traps haven't been recalled yet. And this isn't even to mention the Voyager Energy Crunch, which shows up every fourth episode or so only to be forgotten by the next week (or, in the case of "The Cloud", by the fourth act). So I just want to get these criticisms out of the way first, as a way of indicating that, for me at least, this episode starts out behind the 8-ball. Kevin: This is the first in a couple of episodes that I think constitute a Voyager sub-trope of the trope: the "photonic" lifeform that interacts with the holodeck instead of the crew. I understand given that we have a holographic crew member, it raises the possibility of other holographic life. That's fine, but it raises a lot of questions that the show doesn't answer. Where did the crew go when they were taken from the holodeck? Something had to happen to their physical forms, and it's unclear what that was. Matthew: On the plus side, this story gives us the first instance of the Doctor being liberated from the sickbay, and that's definitely a good thing for the character's growth and storytelling potential. I generally liked the way the crew turned to him in this particular pinch, and the way he sort of earned his stripes with Janeway. On the other hand, I think we've basically given up for the time being on making any attempt to explain how and why the Doctor went from "Toaster" to "Sentient" in the space of no minutes of screen time (Season 5's terrific "Latent Image" notwithstanding). It bugs me, because I think there is good sci-fi, not to mention philosophy of mind and metaphysics, being bypassed here. Kevin: It's funny, I remember reading the special edition TV Guide (which I still have in a box somewhere) when the show premiered, and it gave away the plot point that the unnamed Doctor would eventually take the name "Zimmerman." I always wondered if that reveal prevented the writers from actually doing it, since we spend a lot of time selecting a name in this episode only to have to him drop it. I did like that the pool he chose from was other doctors. That was cute. I agree they should have had more direct engagement earlier in deciding if and how the doctor was alive. Is it just the unexpected result of cumulative experience? Is leaving him on the same as asking for a character who can defeat Data? Even if the issues were murky, it would force Janeway to err on the side of respecting a possible lifeform, and that could have been a fun episode. Maybe that could have been the hook here. She could have thought of him like a tool, a la the Exocomps, and ordered him into a dangerous situation without concern for having to reboot him from the backup. Then we could get the conflicting desire to want to participate, but also not recklessly risk his existence. It would have given this story a little more teeth. Matthew: Simply taken as a Doctor story, this is pretty OK. I enjoyed his humor for the most part (tabling questions of where it comes from), and I enjoyed seeing him adapt to new environs and figure out the mystery. I liked the sort of gaming conventions that seemed to abound in the simulation, such as dialogue trees and repetitive scripting. The mystery itself? Kind of lame. I know that lots of Trek stories end with the "it was all a misunderstanding" theme, but each time it recurs, the lamer and less dramatically interesting it gets. Everybody gets returned, no one is hurt, nothing terribly interesting happens. I think, perhaps, that something much more interesting could have occurred in this episode. Maybe they could have somehow dramatized the Doctor directly interacting with these photonic beings (since he is one too, I guess), and this interaction could be what pushed him to a greater level of consciousness. Kevin: This episode always felt to me like they thought, "Let's put the doctor on the holodeck," and didn't really flesh it out too much beyond that. I enjoyed the use of Beowulf for the holodeck setting, at least for the visuals. I always wonder how people adapt literature for the holodeck. Are you just reciting the lines? Can you change the story? What about the parts your character doesn't witness? Pride and Prejudice is a favorite of mine, and I would love to get to kiss Darcy at the end, but the act of living the novel would really just be me/Elizabeth Bennett writing and reading dozens of letters. As for the mystery, I agree. We'll see it again in Twisted, which while giving rise to some fun moments, still has the same problem. Once you realize there is no malicious intent, the episode kind of retroactively loses drama, and since there is never meaningful direct interaction, no real emotional payoff either. Matthew: This may sound pedantic, but hey, what are we here for? The terminology "synaptic pattern" really annoyed me. A synapse is a gap between two neurons over which an electrical or chemical signal may be transmitted. It describes a distinct physiological structure. Just where is the synapse in a blob of light? I think this "other" life form was just a story convenience, not an actual idea that amounted to anything, and that's a shame. Even the aliens in "Night Terrors" seemed more fleshed out, and that's not saying a whole lot. Kevin: This was my problem with The Cloud. You can sense synapses in light waves, but not contemplate a nebula is a large lifeform, given that Starfleet vessels have encountered them before. It's one of the other tropes of science fiction and Star Trek in particular that always leaves me a little flat. The idea that however foreign or strange, "life" has some detectable quality that "not life" has that registers on sensors or with telepaths. 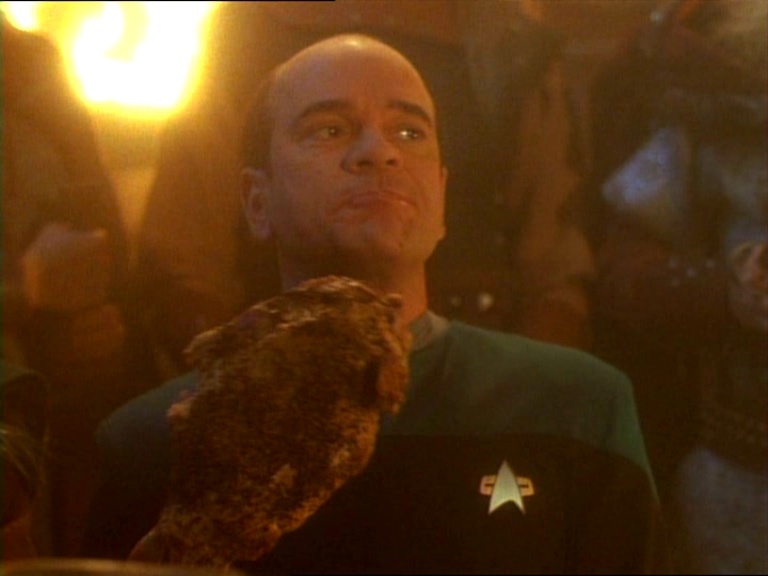 Matthew: Robert Picardo is asked to anchor this show, and I think he does so ably. He portrays both dry humor as well as nervousness and discovery quite well. His interactions with the holodeck characters were fun to watch, and he showed some good physical comedy chops in the sword fight. The main actors in the rest of the cast had mostly technobabble to deliver. Mulgrew got a pretty decent scene on the back end of the show, congratulating the Doctor. Kevin: Even at my least charitable toward this series, I have always acknowledge that I liked all the female characters and the Doctor a great deal. Picardo, like Mulgrew, really has the ability to sell an idea or emotion, even if the script may not be as supportive as it might be. He's great with jargon and while I won't say he's better than McFadden at the prop work, he's certainly no slouch. But obviously, his greatest asset is his dry delivery. Every show needs a straight man and a grouch to offset the shiny happy Starfleet crew, and it's a job he does with aplomb. Fortunately, he can also sell quieter moments, like Freya's death scene. Matthew: Marjorie Monaghan was great as Freya. She perfectly embodied the sort of earnest, almost silly seriousness that a character in a role playing game would possess. She had good chemistry with Picardo, too. I liked Michael Keenan as Hrothgar, too. I thought he was a very believable Viking leader trope. Kevin: I love Monahgan's voice. There's a wonderful richness to her voice. She had a recurring role as a Mars resistance fighter in Babylon 5 (I show about which I feel many different feelings) and she was a highlight there as well. For this role, she did nail the bravura of a "shieldmaiden" without a hint of winking at the camera. She was apparently considered for T'Pol on Enterprise, and as much as I love Blalock, she would have been an interesting choice. Matthew: The inside of the Mead Hall was pretty nice, but I found the forest setting to be a bit annoyingly dark. Th visual effect on the Flying Spaghetti Monster was just so-so. It reminds me of a vitreous floater. The fact that it clearly had photonic flagella kind of raised the question of why no one would think the thing was alive just based on a cursory glance. Kevin: Paramount Studios must have a pretty deep bench when it comes to period sets and props. I've never seen a period piece that falls flat. I totally agreed on the light being. The arms clearly indicate life, and especially in standard definition, is really washed out on screen. Matthew: The Viking costumes were fun. I especially liked Freya's sexier number. It really flattered the actress, and it had me wishing that the romance scenes would have been a bigger part of the episode. Matthew: I want to like this more than I do, and I want to forgive this episode its sins. I can imagine a casual fan liking this more than I do. But I'm not that fan. Irritating tropes and untapped story potential are enough to keep this in 2 territory for me, despite a pretty good lead performance. Kevin: This episode almost typifies my earlier statement about Voyager. I like the women (even the guest star) and I like the Doctor, the rest...not so much. 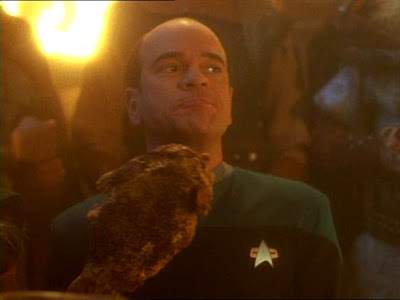 I want to say Picardo's ability to make me literally (the literal literally, not the figurative literally) laugh out loud elevates this to a 3, but it does not. There isn't really a story in the story, it was just an excuse for the Doctor to go to the holodeck. Had they just done a Data's Doctor's Day episode about that, it might have yielded a substantially better result. That makes a total of 4.